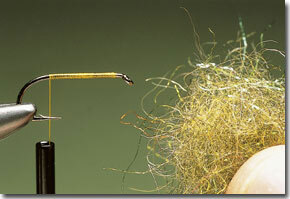 Top Austrian flyfisher Roman Moser developed this innovative fly pattern. It is tied to imitate a sedge fly emerging from its pupal skin right at the water’s surface and, in order to get the profile as realistic as possible, it uses buoyant, closed-cell foam rather than a hackle to keep it afloat. The yellow foam thorax not only helps to keep the fly floating, it provides a distinct hump, very like that created by the emerging adult sedge. Because of this, the Balloon Caddis is a deadly pattern when both trout and grayling are taking sedges in that half-in, half-out stage at which the insect is at its most vulnerable. 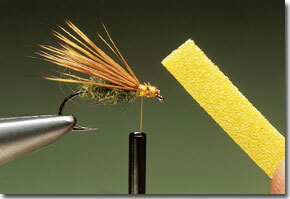 Additional buoyancy comes from a wing of deer or elk hair tied low over a body of dubbed fur. The body itself is tied quite full to represent the plump body of the sedge pupa and may be tied in either amber or green. When using foam it is important not to overstretch it, as this compresses the tiny bubbles and reduces its buoyancy. Unlike when using a thin plastic strip, the foam is merely folded over and secured in position with tying thread. Also, don’t skimp on the amount of foam used as this, too, will prevent the finished fly from floating properly. 1. 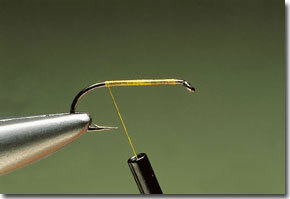 Fix the hook in the vice and run the tying thread on at the eye. Carry it down the shank to the bend in touching turns. 2. Take a large pinch of green Irise Dub. This product has small trands of pearl material held in a base of roughly textured fibres. 3. Tease out the fur and apply it evenly to the tying thread. Dub it on to the thread to form a coarse rope. 4. Starting at the bend, wind the dubbed fur along the shank in close turns. The aim is to create a chunky abdomen similar to that of a sedge pupa. 5. Stop when the fur has covered twothirds of the hook shank. Then remove a bunch of dyed-brown deer hair from the skin. 6. Remove any damaged fibres and, after ensuring that all the tips are roughly level, position the wing with two or three turns of thread. 7. With the wing sitting nicely on top of the body, secure it with further tight turns of thread before removing the excess hair with scissors. 8. Cover the waste ends of the deer hair with more tight turns of thread. Next, cut a strip of yellow foam approximately a quarter of an inch wide. 9. Catch in the foam so that it projects over the eye. The waste end should fill the gap between the eye and the wing base. 10. Wind the thread to the wing base then fold the foam over to meet it. Do not pull the foam tight, as this will reduce its buoyancy. Secure with turns of thread. 11. Cast off the tying thread with a whip finish and remove the loose end. With a single cut, trim the foam so that the trailing end sits just over the wing base. 12. Finally, run a small amount of clear varnish into the thread wraps to secure the foam strip in place. 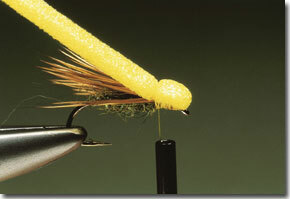 The Balloon Caddis works on any river where sedges abound. It works best in medium-fast runs rather than slower pools. Being a specific imitation of a hatching sedge, it is most effective when the fish are taking the naturals close to or right in the water’s surface. Major hatches of these medium-sized sedges take place from early through to late summer. Fished singly on a floating line and a tapered leader, the pattern is cast upstream and allowed to dead-drift with the current. It can work well if given an occasional twitch to mimic the movement of the natural. When securing the foam in place, do not pull the thread too tight as this can easily cut the foam.